Yesterday was E-Day. That stands for Eve’s Day of Axtreme Yndustriousness. EDAY. All in all, I’d say that’s a pretty productive day. Considering the amount of extra research I had to do yesterday, I’m well on my way to finishing this paper and well on my way to finishing that baby jacket. The buttons still need to be sewn on, but I don’t have enough battery power in my camera to show you what they’ll look like. I have daisies and duckings! I’ll let you choose when my camera comes back to life. Eve is a PhD student in cognitive neuroscience at the University of Toronto, Ontario, Canada. Her personal blog is The Swamp. 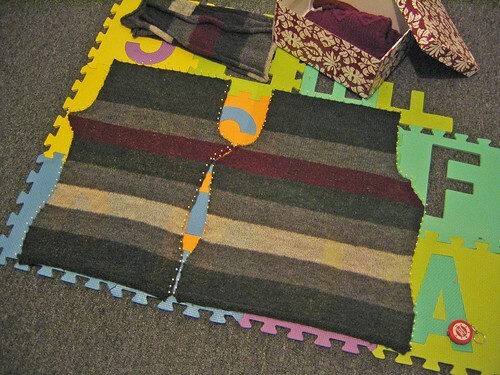 This entry was posted on December 14th, 2007 at 12:47 pm and is filed under Baby Clothes, In Progress, Recycling, Touch of Grey Sweater. You can follow any responses to this entry through the RSS 2.0 feed. Both comments and pings are currently closed.